It has been a very long time since I posted anything from Rookie Dad Journal so I thought I would share a few of the finer moments that I have experienced being a Dad. December 3 – Well after Kyle puked all over me and him in the middle of Target I realized that the hot dogs I have been feeding him were expired and that probably explains why the little man is still throwing up. Totally feel like the parent of the year. December 10 – Kyle became a little boy today. He got his first hair cut. He sat in my lap and was a good little man while he lost all of his baby hair. December 12 – Kyle just makes me laugh so much. He was eating dinner and put taco meat on top of his head and kept saying “Hat.” My little meathead. December 24 – So happy that when I opened the boxes to Kyle’s Christmas presents only one of them had a package of screws. I was so worried I was going to spend hours putting his presents together but everything was done and ready for him in under 30 minutes. December 28 – A little scary that after Kyle ate his breakfast he grabbed his blanket, turned on the TV, and then sat on the couch. 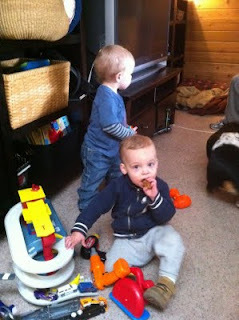 January 8 – The little climber pulled himself out of his pack-n-play and came walking out of the room. I was quite surprised to see the little dude since he was supposed to be taking a nap. January 9 – The number of items that have vanished into thin air have increased significantly since Kyle has become older, wiser, and more mobile. Either that or I am losing my mind. January 20 – Introduced Kyle to Chef Boyardee today and he politely said no thank you to the beefaroni. January 30 – Kyle learned what his “pee pee” was and hopefully he does not decide to share that information with people in his class. February 15 - It is hard to be mad at the child for not taking a nap when I walk into his room and he is practicing hand stands with his pants off in the crib. He is always doing something to make things interesting. March 5 - Sarah and I spent some time trying to figure out how many words Kyle can say and from what we can gather he is over 50. He understands a lot more than that but his vocabulary has not caught up yet. March 7 - I swear we are doing our best to poison the little man. Today he got V8 that was 3 months past its expiration date and it produced some interesting color and texture when he pooped later that night. March 15 - Day 1 of Kyle in his big boy bed went pretty good. He played around a little bit and I had to remind him that it was nap time. He eventually settled down and went to sleep. Fist pump!! March 23 - On the road for our first ever Spring Break trip. We are going to Zion National Park and Mania gets to enjoy Elmo and Abby on a DVD player while we travel. March 30 - Kyle’s last day as a 1-year-old little boy and he made laugh out loud. We were at a kid’s clothing store trying to find him some new PJs and he went to the play room to play of course. Well there was an older boy stacking blocks very efficiently and had himself a rather large stack going until Desctructocon came in and went Godzilla on it. The older boy just put his hands on his head and shook his noggin’. I am thinking he must be a big brother. April 5 - Finally getting off my lazy behind and getting an official copy of Kyle’s birth certificate. Yes, son, I hope when you are older and reading this you are so very proud of my procrastinating skills. Kyle and his buddy trying to polish off their cookies before the Tankster moves in for the kill. you're not a rookie anymore, you're an old pro now! good idea with the birth certificate, 45 years from now people might be demanding to see it. Excellent point, BP, about the birth certificate. Hopefully they will only demand to see it because he will be still the world's most awesomest soccer player and think he is from another planet with his skills. December 12: LMAO!!!! Reminds me of Sh#t My Dad Says...LOL ad infinitum! That was hilarious. Thanks for sharing! Love reading your journal, it makes me wish I could go back several years to when my lad was small. I agree with Billy Pilgrim, you're no longer a rookie. Have a great weekend. I think instead of saying you are poisoning him with expired food, you should say you are building up his immune system and toughening up his stomach. It sounds like a good thing then, right? Billy Pilgrim already said what I was thinking. It's cool that you have all these events and thoughts documented, for the future. I'm still very impressed that you've kept this for him. I had wanted to do something similar for Colin, but I didn't follow through. Awesome! Your son is gonna love reading this when he is older. Quite the humorous and witty dad...... he'll be proud! Great journal entries and love the blog! Makes me laugh every time I visit!